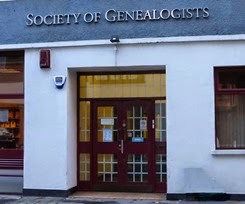 The Society of Genealogists (SOG) in London will host two Saturday morning sessions next month aimed at family historians with Irish ancestors. Both run from 10:30am to 1:00pm and will be held at the SOG's offices at 14 Charterhouse Buildings, Goswell Road, London EC1M 7BA. There's a fee of £20 for each workshop. These sessions tend to be popular, so don't delay booking your place. It is estimated that there are over one million people of Irish birth in Britain today, plus numerous second, third or fourth generation Irish. Their major genealogical challenge is to determine their Irish ancestor's actual place of birth; without this it is nigh-on impossible to undertake any research within Ireland, even when researching a fairly uncommon surname. Details and booking. 28 February: The Irish in Victorian London, with Else Churchill and Michael Gandy. According to census returns, the numbers of Irish-born immigrants living in England and Wales almost doubled between 1841 and 1851 to over 520, 000. Some 109,000 lived in London where they were perceived as a strain on the resources of the Poor Law and charity. This course looks at where they lived and where they came from and the efforts made to return many to that place. Details and booking. © Claire Santry 2010-2019. Ethereal theme. Powered by Blogger.